As you may have gathered from previous posts, oatmeal is my favorite breakfast of all time. I’ve eaten it almost every morning for the past 5 years, cooked and uncooked! Aside from its awesome nutrition stats and yummy taste (with mix-ins and toppings of course), probably what I love about oatmeal is that it’s quick and easy to prepare. On the weekdays, with school or work, I’m always in a hurry to get out the door ASAP. 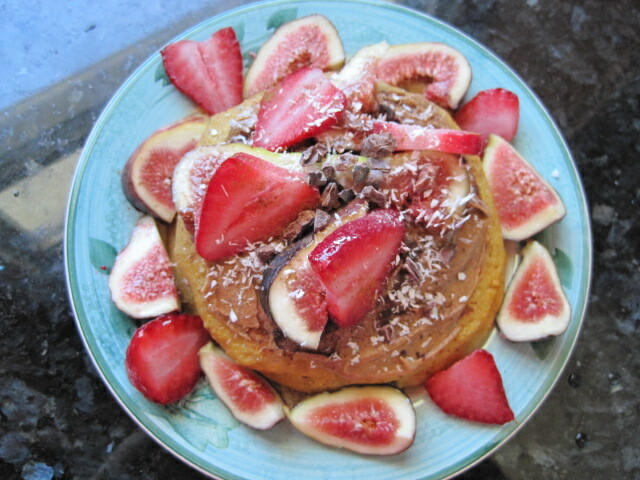 Otherwise, I am usually too lazy to spend too much time in the kitchen to get “creative” with breakfast. Those are the times I am glad that oatmeal cooks in 3 minutes in the microwave or that it’s already waiting for me in the fridge. Oats are reliable and get the job done. But this morning, I decided to spend a little extra time in breakfast preparations and try my hand at something different and new-to-me: pancakes. I have never made pancakes before, from the box nor from scratch. However, after seeing them everywhere in the blogosphere for the longest time, I’ve been itching to make my own version. 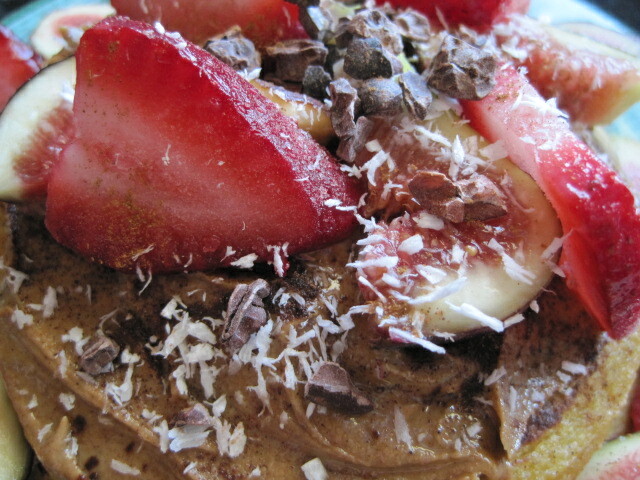 These are not your ordinary pancakes though. 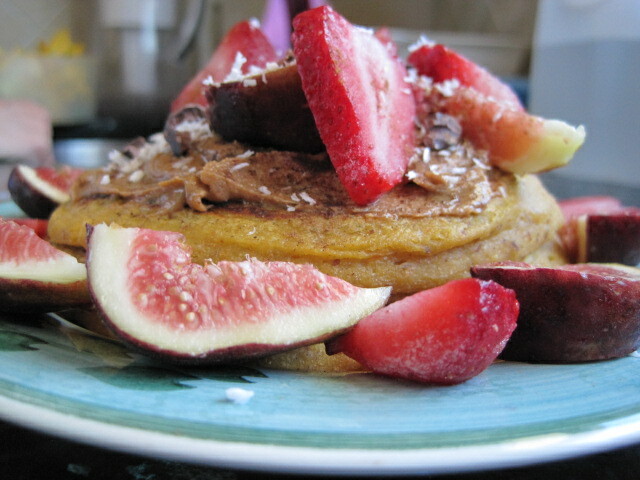 Pancakes made in a house that is slowly being taken over by butternut squash become butternut banana pancakes! Makes 6-8 pancakes (2-3 servings). Steam butternut squash and let it cool. 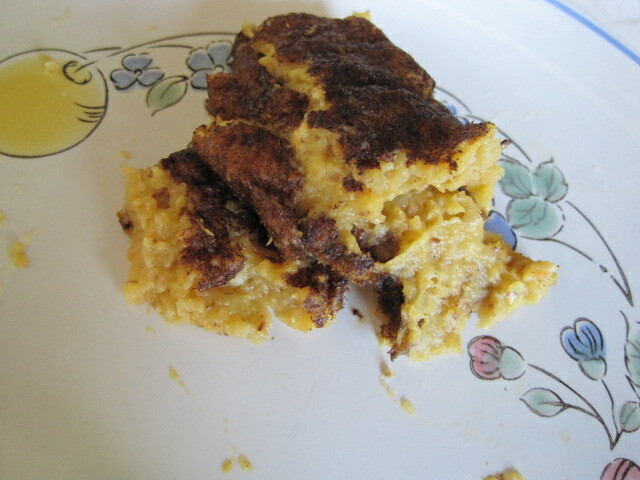 Put butternut squash, carrots, banana, cinnamon, salt, oats, soy milk, and water into blender. Blend until almost smooth, then transfer into a large mixing bowl. Add flax egg to the mixture. To make a flax egg, combine 1 tablespoon of ground flax seeds and 3 tablespoons of room temp./warm water, and let sit for a few minutes until it thickens up. Fold in whole wheat flour in 1/6 cup (1/3 cup filled half way) increments. Use enough to achieve a typical pancake batter consistency. Add the 1 teaspoon of olive oil. This little bit goes a long way to ensure that the pancakes stay moist on the inside and non-stick on the outside. Lightly grease griddle or large shallow pan with cooking spray. If you don’t have cooking spray (I don’t), dab a bit of olive oil onto a paper towel and rub it around. Turn heat to medium. 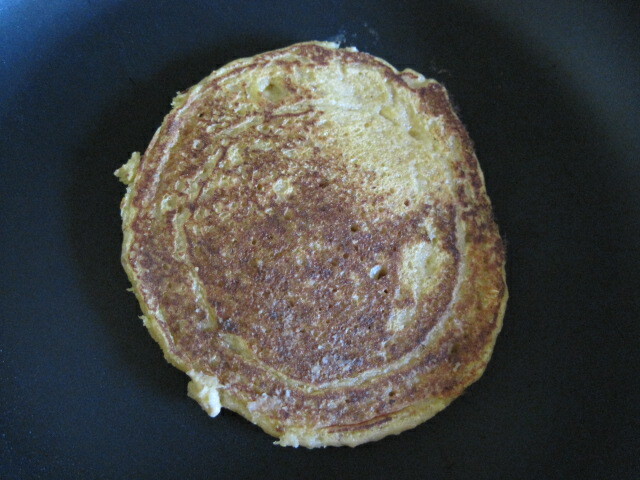 Scoop some batter onto the griddle or pan to make round circles. Flip when edges turn brown or start to bubble a little. Let each side brown for about 2-3 minutes. Or, let your nose be the judge. 🙂 My pancakes were made with about 2 tablespoons of batter each. The mix yielded 6 pancakes (2-3 servings). If you want, you can put that extra half of your banana to good use. 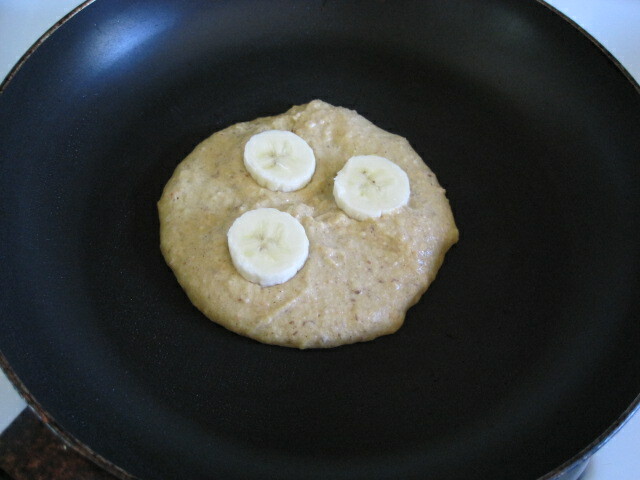 After scooping out the batter onto the griddle or pan, place 3 banana slices on top. 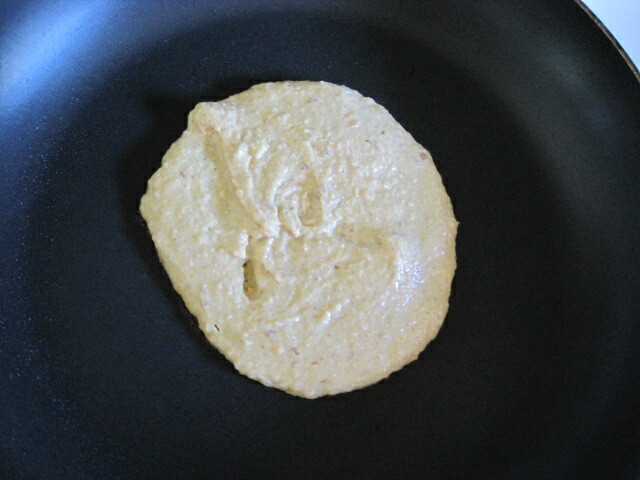 After flipping, press down a bit onto the pancake with your spatula. 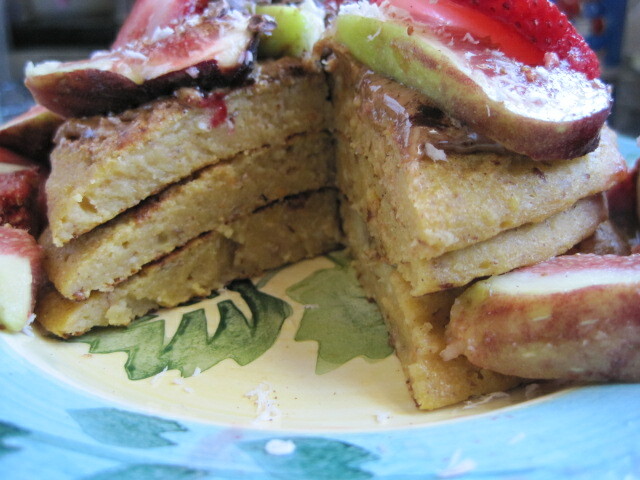 This will ease the banana slices “into” the batter. 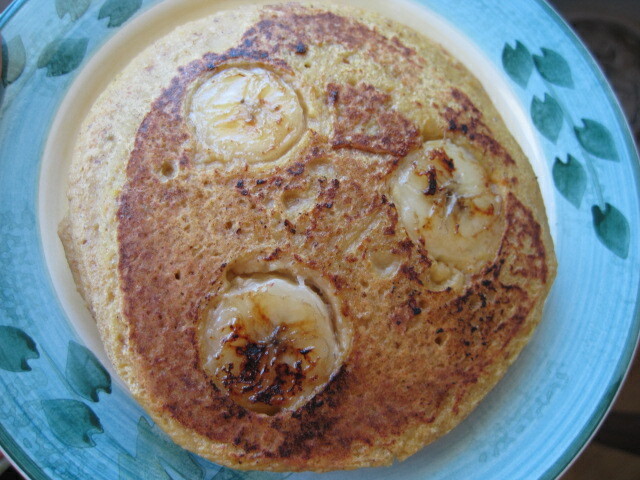 Be careful when you flip the pancake; you don’t want to lose a banana piece or mess up the batter surface! 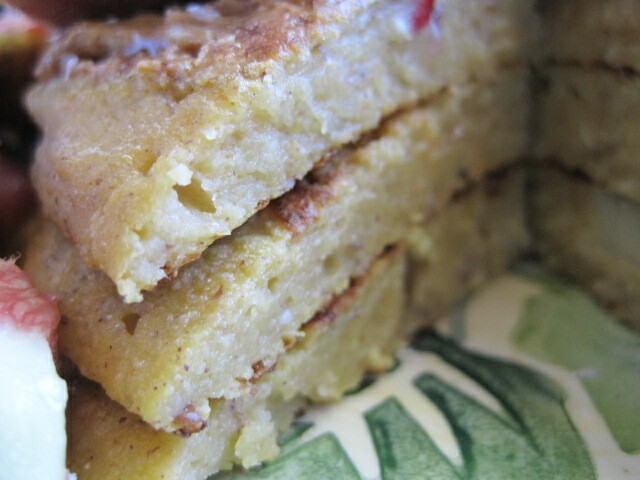 I made 3 plain and 3 with embedded banana slices. I gave away 1 banana-on-top and 2 plain ones for my parents and grandma to try. 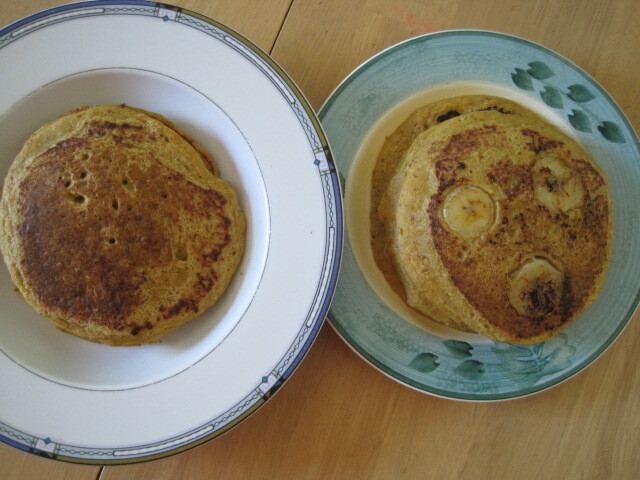 (They actually ended up eating only two, so I had one for a snack later :)) I wanted to put toppings onto the pancakes because I wasn’t sure how good they’d taste unadorned, but my mom insisted on tasting them without. They liked them! I think they loved the healthy ingredients the most. Here’s a cross-section so you can have a look at the inside of the cakes. These are not dry pancakes, my friends! I think you can thank the butternut squash for that. Mmmm 😀 They were good. 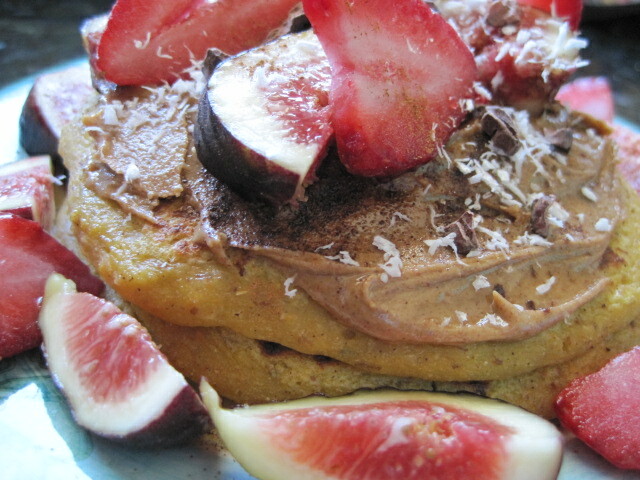 I think pancakes make a great lazy weekend brunch. I ended up eating these around noon! Do try these pancakes sometime! 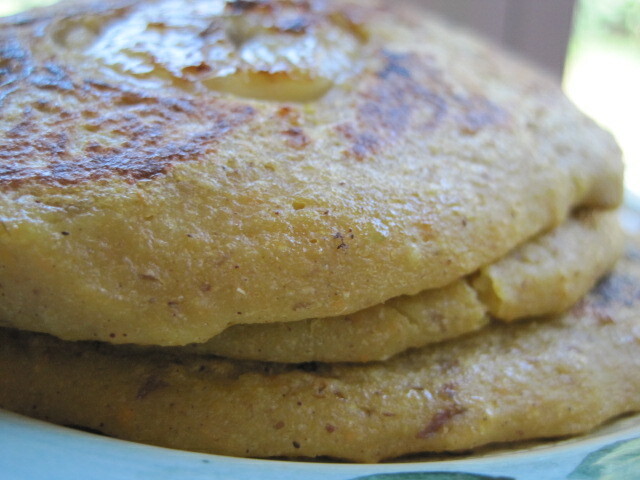 They are packed with wholesome ingredients (again, veggies for breakfast?! 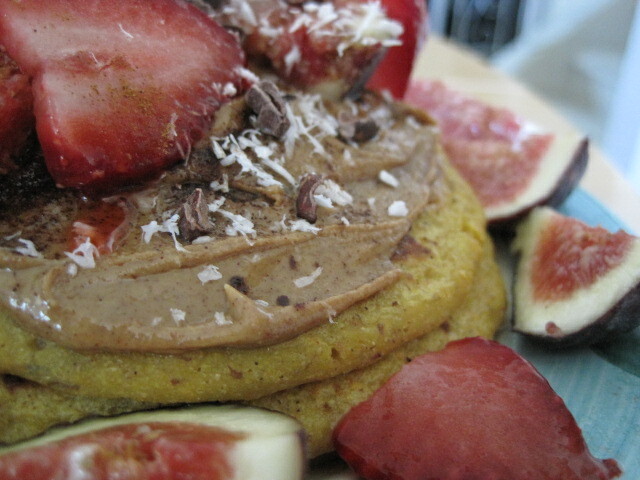 ), have no refined sugar (ripe banana instead), and definitely fill you up (thanks, oats and flax!). 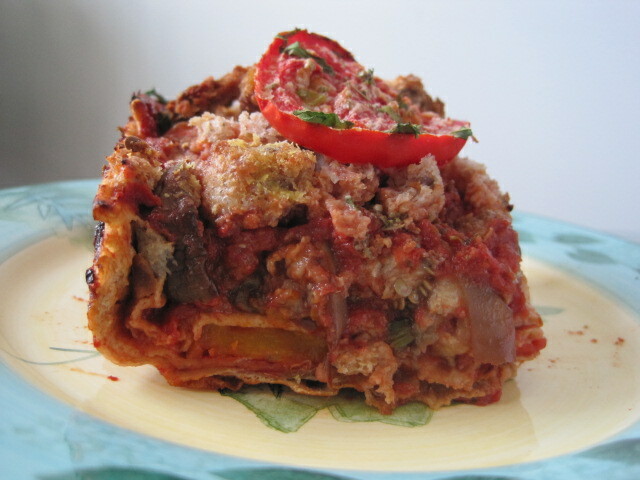 Of course, I encourage you to make substitutions (aka use eggs and dairy milk if you aren’t vegan) as you see fit, for your personal taste and convenience. 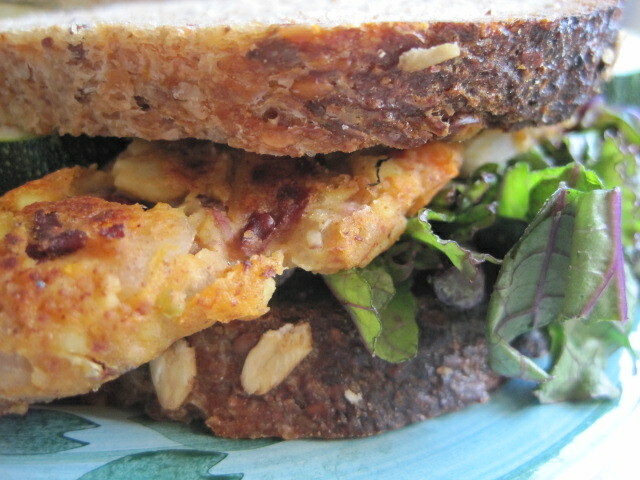 If you missed my previous recipe involving butternut squash, you can check it out here and here. Enjoy the rest of the beautiful weekend! !